This is a collective haul I did in the past two weeks, and I have to say I did some damage! Urban Decay's Naked Palette is a product that I wanted for such a long time, from the first moment it was released but I always avoid buying it because I have so many neutral eyeshadows. But I had a 10% coupon code at BeautyBay, and I told myself, why not? So I got it. It's so pretty, seriously!! 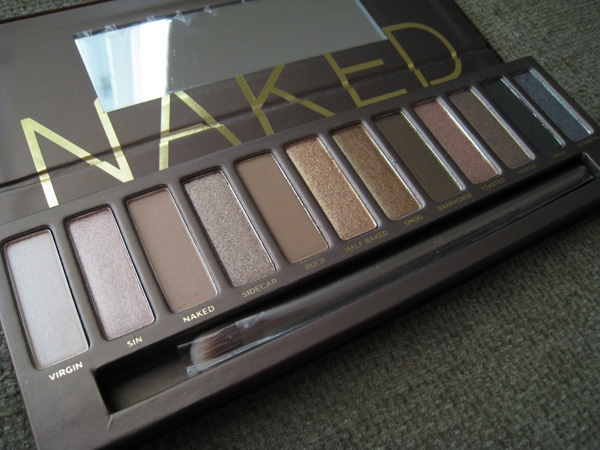 I chose the first Naked palette over the 2 because it has warm tones and they suit me the most. I still haven't used it or swatched any of the eyeshadows, but I'm pretty sure this palette will be in one of my next month's favorites! Also lookfantastic a few weeks back had a 10% off of all the Moroccanoil range, so I decided to try for the first time the Moroccanoil treatment, in the small size. I've already used it 3 times, and I have to say it does an amazing job, specially for blow drying and straightening your hair, but I think it's a little too heavy for my fine hair. I have to try it a few more times to be sure. At the Clinique counter I got the High impact mascara, an old favorite, and I decided to try a new sunscreen, the City Block SPF25 since I think the one from La Roche Posay I have it's breaking me out. I hope this one won't break me out too, it seems like every susncreen I try breaks me out! This has also a light tint, but it doesn't show up on my face. And from Clarins I got the famous Natural Lip Perfector in #2 Apricot Shimmer. It seems like everyone had this already, and I really wanted to try it. Even though it says apricot, it's mostly a light milky pink shade, it reminds me so much of Korres cherry lipgloss in light pink, an exact dupe I would say, but I like Korres texture way more. The thing that I don't like in the Clarins Lip Perfector is that after a few hours it creates that milky ring on my lips, which I hate! But I have to say that I love the vanilla cake taste it has, way better than the artificial one that Mac has. Have you try any of these products?? Do you like them? Let me know!! Καλοφόρετα όλα! Χιχιχι! Θέλω το Marocanoil ΤΩΡΑ! Na'sai kala Vasso mou! Sigoura tha sou pw! Exw Naked+MoroccanOil k ta latrevw! Tin Naked tin eixa kai tin edwsa sti Natalie giati den moy arese katholou!! Sta matia mou ta xrwmata den fainotan kai epishs den eixan katholou diarkeia!! To antiliako tis Clinique to eixa persi kai omologv oti apo ta pio elafrya tis agoras. Auto pou sou prokalei to "varos" sto proswpo soy exw tin entypwsi oti einai h ousia pou apotelei to filtro gia tin iliakh aktinovolia...To kako einai oti sou prokalei kai break out. Elpizw auth na sou pesei pio elafrya kai na tin kataeuxaristitheis!! Krima pou den sou tairiaxe i Naked :-( Les gia ta ximika k fusika filtra etsi? Gi'auto eipa na dokimasw k tis Clinique pou exei fusika filtra na dw! Xaxaxa nai ekana!! Bebaia k tha to kanw! τελεια ολα!το λαδακι θελω απελπισμενα να το δοκιμασω!καλοφορετα!! Με γεια σου...Τη naked τη δοκίμασα πρόσφατα και έχω να πω ότι είναι εξαιρετική!!! Nai pragmati, polu wraia geusi, xwris na se arrwstainei! Πήρα μια αντηλιακή της Clinique και το μετάνιωσα, τελικά δε γλιτώνεις τις ασπρίλες με κανένα αντηλιακό με υψηλό δείκτη- εκτός αν είναι tinted όπως αυτό της Clinique! Θα είναι σίγουρα η επόμενη αγορά μου. Το ροζ Clarins lip perfector είναι λίγο πιο "διάσημο" από το apricot ή είναι ιδέα μου; Η Naked πάντως δε φαίνεται να έχει overly warm αποχρώσεις, έχει τόσο ζεστούς τόνους όσο πρέπει. Με γεια σου, ζηλεύω το haul σου!!! Nai oso pio upsilo deikti exoun toso pio aspro, eidika auta pou exoun ximika filtra. Den xerw pia apoxrwsi tou Lip Perfector einai pio diasimi akrivws, alla apo videakia k blogs vlepw oti to apricot k to mpez feugoun perissotero. Με γεια σου!!! Τελεια ολα πραγματικα! Το Moroccanoil ειναι σουπερ αγαπημενο, το μονο που χρησιμοποιω πλεον και δεν νομιζω να το αλλαξω συντομα..
Η High Impact επισης υπεραγαπημενη, μολις μου τελειωσε και θα την ξαναπαρω σιγουρα! Na'sai kala!! I Naked einai pragatika apisteuti, epi 2 xronia arniomoun na tin agorasw, fovomaoun oti tha moiazei polu me tis skeis pou exw idi apo Mac, alla oxi, an k einai neutral shades sak tis dikes mou apo Mac den einai idies, k auto me xaropoiise polu! Moroccanoil is my holy grail product. I use it almost every day especially when blowdrying my hair as it quickens up the process. I think Hairtrade is the cheapest place you can get it at the moment.